Lean is a business system for organizing and managing development, operations, suppliers, and customer relations. Business and other organizations use lean principles, practices, and tools to create precise customer value goods and services with higher quality and fewer defects with less human effort, less space, less capital, and less time than the traditional approaches. The core idea of Lean is to maximize customer value (anything that the customer is willing to pay for) by minimizing waste (any resource that cannot create customer value). 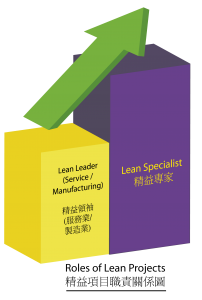 Certified Lean Specialist Programme is a higher-leveled programme to all personnel who have completed foundation lean training courses or have lean implementation experience to equip with further knowledge and skills of ensuring lean implementation success. Please click here to review further details of our professional registration.